The Kurt J. Lesker EMS 18 dielectric sputtering system has three confocal 3" magnetron guns. It is equipped with automatic process pressure control and is able to produce RF, DC and pulsed DC plasmas. Currently the system is configured for pulsed DC. Targets currently installed are intrinsic silicon, p-type silicon and n-type silicon. 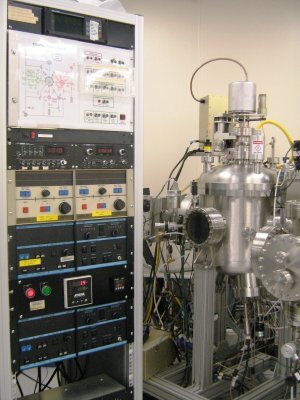 This system is currently attached to the Cluster Tool, which allows the users access to metal sputtering, dielectric sputtering and e-beam evaporation without breaking vacuum. The cluster tool is equipped with a loadlock system that reduces system contamination providing for cleaner film deposition.